Few days ago this Guardian article mentioned aubergine has more nicotine than other vegetables. Guess I may be addicted to this humble spongy vegetable. I have posted quite a few oriental recipes with aubergine. Aubergine is one of those vegetables that must be thoroughly cooked to give it a silky texture and sweet flavour, utterly delicious IMO. Undercooked aubergine is awful feels and tastes like tasteless chewy sponge. This recipe is something I threw together that I think worth posting to share. It's easy just mix and steam, clean cooking. It has three layers of ingredients. 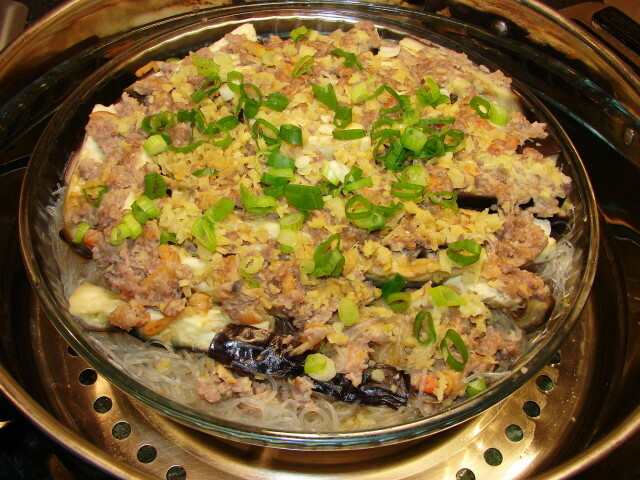 The salty spicy fishy meat flavour infused the aubergine, and the glass noodles absorbed both the juice and flavour from the pork and aubergine. Mix pork, dried shrimp, shrimp sauce (or oyster sauce), light soy, sugar and half the chopped garlic and ginger together. Drain soaked glass noodles, cut into shorter length with scissors. Spread the noodles on a deep dish. I used a pyrex dish. Sprinkle on a little light soy or pinch of salt. Cut the aubergine into fingers. Spread this on top of noodles. 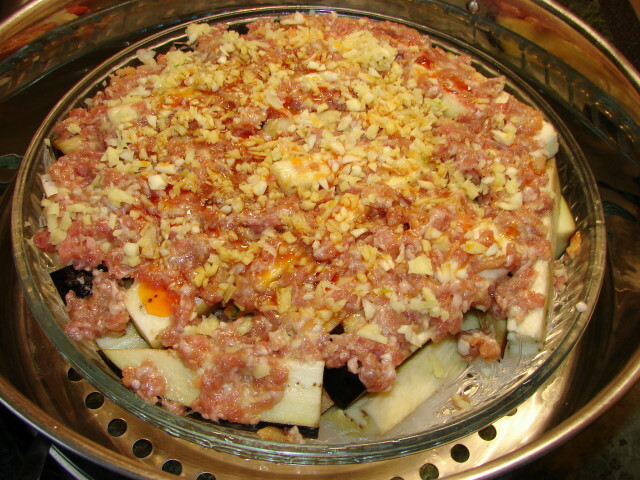 Spread the meat mixture on the aubergine. Sprinkle on the rest of garlic and ginger. Add few tbsp of water around the dish. Steam for 20 - 25 minutes till aubergine is tender. Sprinkle with some chopped spring onion. I've made this a couple of times now — first time it didn't turn out quite the way I wanted, but the second time (tonight) it was a lot better. I love all the ingredients in this, so thank you for posting it! Here's a pic and some notes on what I got wrong the first time: on Tumblr.